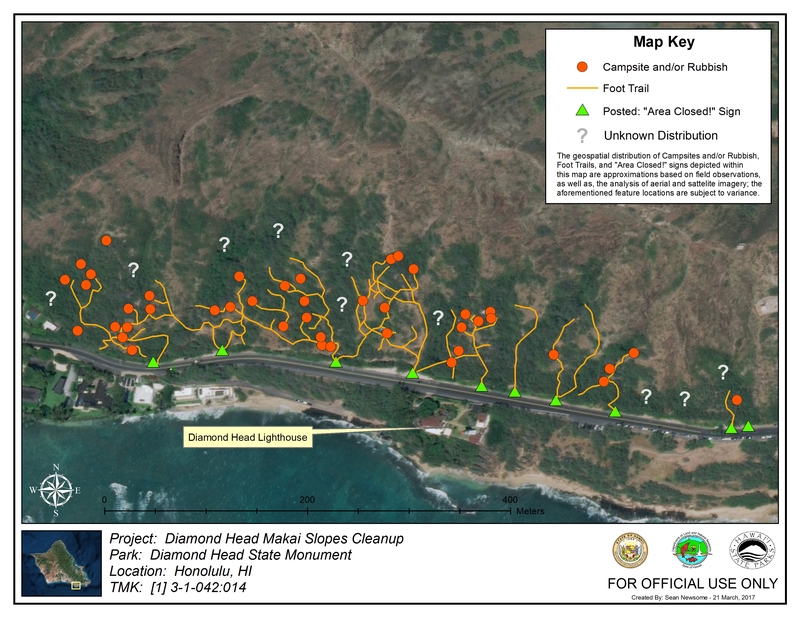 (HONOLULU) – Following six months of outreach to homeless individuals living on the slopes of Hawai’i’s iconic Diamond Head, crews from the DLNR Divisions of State Parks and Conservation and Resources Enforcement (DOCARE), along with a private rubbish contractor removed tons of debris from illegal camps within Diamond Head State Monument. They were joined by state outreach representatives. As with all the previous visits to Diamond Head, a team of DOCARE officers participated today. As of 9 a.m. they’d issued seven (7) citations for the violation of being in a closed area. DOCARE Enforcement Chief Robert Farrell commented, “Citing these people is the last step in this concerted effort to enforce park rules.” This is the third clean-up of illegal camps at Diamond Head State Monument.